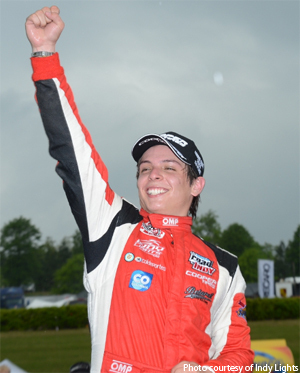 Leeds, Ala. – Less than 24 hours after making contact at the first corner and compromising their races, Belardi Auto Racing teammates Gabby Chaves and Alex Baron bounced back with an impressive 1-2 finish in today’s second round of the Legacy Indy Lights 100 at Barber Motorsports Park. Yesterday’s winner Zach Veach had to be content with a third-place finish, which allowed Chaves to close within nine points of the championship lead after four rounds of the Indy Lights Presented by Cooper Tires. Chaves, who won Round Two at Long Beach two weeks ago, knew he needed a strong result to keep his title rival within reach. He gave himself a good opportunity to do so after securing his second pole of the year – by virtue of posting the second fastest lap in yesterday’s lone qualifying session – and took full advantage at the start by leaping clear of fellow front row starter Veach (Andretti Autosport) as the green flags flew. Even better, young rookie teammate Alex Baron (Liberty Engineering/13th Avenue) anticipated the start perfectly to shadow Chaves’ #5 Marca Colombia/Coldeportes car into Turn One and make the move into second place. Colombian-American Chaves quickly made good his escape, increasing his advantage on every one of the first 15 laps and stretching out the margin to over four seconds. Baron, 19, who carries dual French and British citizenship, narrowed the deficit to a little less than 2.5 seconds before Chaves increased his pace again and cruised home to his second victory of the season. The race was actually cut a couple of laps short as rain began to fall, but rookie Baron secured the best result of his young career, while Veach maintained his sequence of podium finishes in third with the #26 RePLAY XD/The Young Marines/Ads IT Solutions/Zakosi Data Back Up car. Veach now leads Chaves by 181 to 172, in the drivers’ standings. The Team Championship is even closer, with Andretti Autosport leading Belardi Auto Racing by a solitary point, 111-110. Brazilian Luiz Razia once again was the top finisher for four-time defending championship-winning Schmidt Peterson Motorsports with Curb-Agajanian, remaining hot on Veach’s tail throughout the race. Teammates Jack Harvey and Juan Pablo Garcia finished fifth and sixth, with Mexican Garcia driving well to make up for a poor start and crafting several strong passes along the way. Garcia’s pass on Vittorio Ghirelli of Team Moore Racing on Lap 8 in Turn Five earned him the RePlay XD Move of the Race Award. Matthew Brabham (Andretti Autosport) shadowed Harvey for the first 26 laps until a fuel pump issue ended his day. Additional contingency awards included a customized Race Energy BCM21 charger – the official battery of the ladder series – to the winning team of Belardi Auto Racing. The Indy Lights Presented by Cooper Tires contenders will return to action with another pair of races in two weeks’ time at the new Indianapolis Motor Speedway road course, once again in support of the Verizon IndyCar Series.